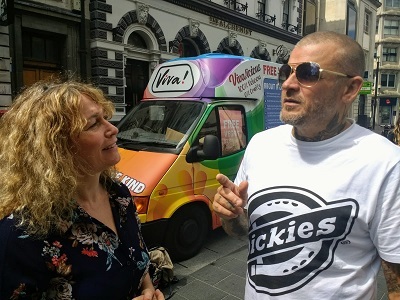 Extremely Successful Viva!licious Ice Cream Van Tour | Viva! Our Viva!licious ice cream van tour was extremely successful! In every city we had an overwhelmingly positive and high response. Throughout each three hour event we had queues of 15 – 20 metres of people waiting to try vegan ice cream. Our Viva!licious ice cream van tour was extremely successful! The tour launched in Cardiff on 31 July and continued to Blackpool, Leeds, Southend-On-Sea, Margate, Brighton and finally London. In every city we had an overwhelmingly positive and high response. 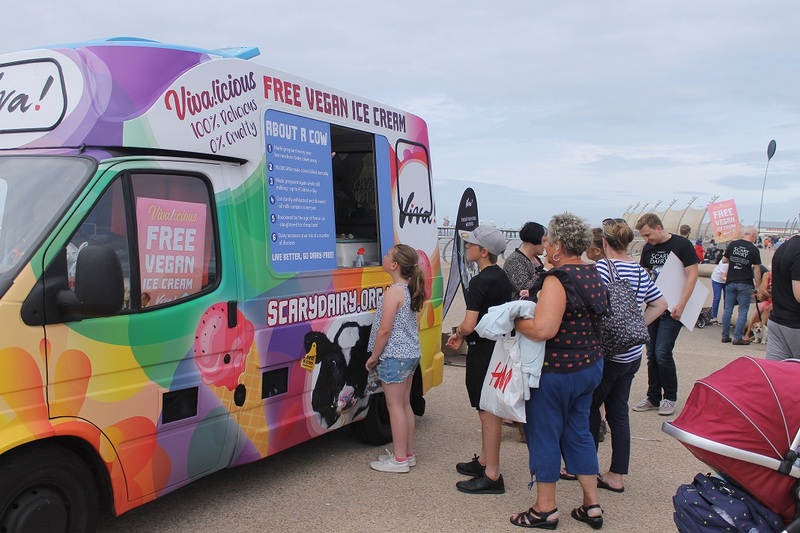 Throughout each three hour event we had queues of 15 – 20 metres of people waiting to try vegan ice cream. Watch our video summary of the tour here. Our outreach team spoke to every single person in the queue about the atrocities happening in the dairy industry and handed out our brand new “Goodbye Baby” leaflet to illustrate the facts and show the British public the best solution to act against this cruel industry - Going vegan! 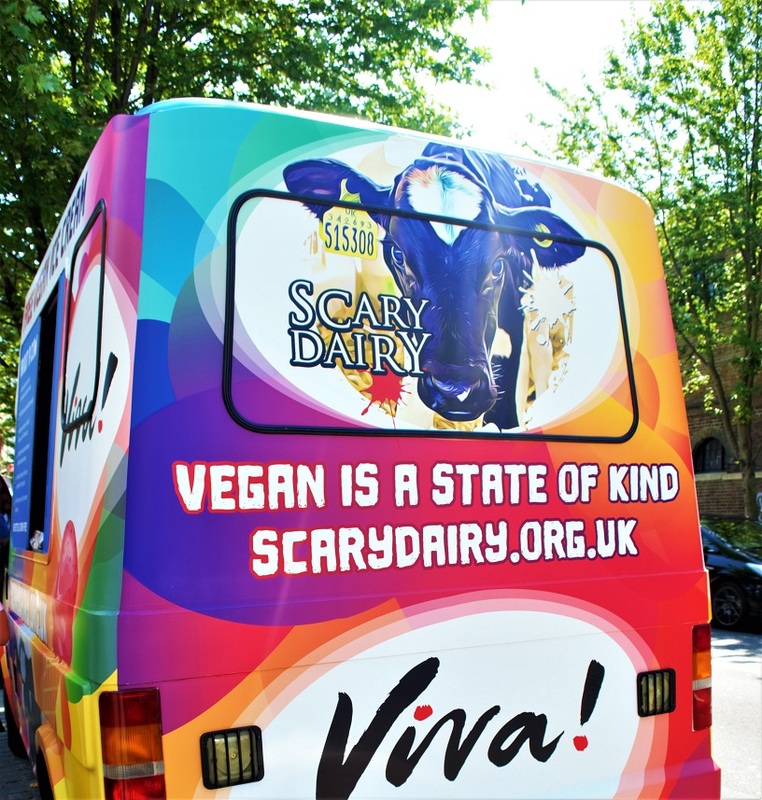 Viva!’s dairy-free pocket rocket and “Everyone’s going dairy-free guides” were well received and given to each person as a useful starter pack to kick off their journey to veganism. We were extremely impressed by how receptive the public was. Around 60 per cent of the people we spoke to had never tried vegan ice cream before. After tasting the ice cream they said they couldn’t taste the difference between dairy and dairy-free ice cream and will opt for the dairy-free option next time they go shopping. Many asked where to buy vegan products and which substitutes to use, showing us that they were truly willing to change their habits. It seemed like once people realised how convenient and easy it is to buy vegan products they were open to make the change. Some people even went vegan on the spot after speaking to our outreach team. 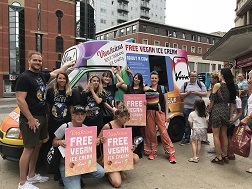 The positive atmosphere and incentive of free ice cream enabled us to speak to members of the public who would not normally be as receptive to conversations about veganism. Many people did not realise that cows have to be made pregnant every year to give milk and were shocked to hear that 95,000 male calves are killed every year as a by-product of the dairy industry. Meat-eaters and vegetarians alike felt determined to cut out dairy from their diet and gratefully took our guides and advice on how to go dairy-free. We asked people to take our “Dairy-free pledge” by signing up with their email address to receive our extensive online guide about how to go dairy-free. Hundreds decided to do so which means they’ll receive useful information on how to act on their newly made resolution to try dairy-free. The support from fellow vegans was overwhelming. 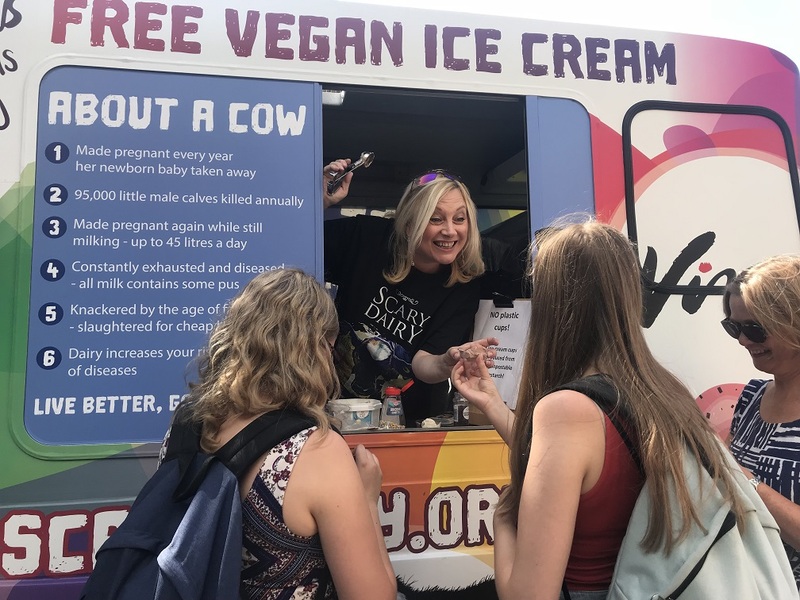 Every single one was totally impressed by the design of our entirely vegan ice-cream van and we received numerous requests from vegan activists to bring the ice cream van to their local town. All in all, we had an overwhelming positive response to this campaign. 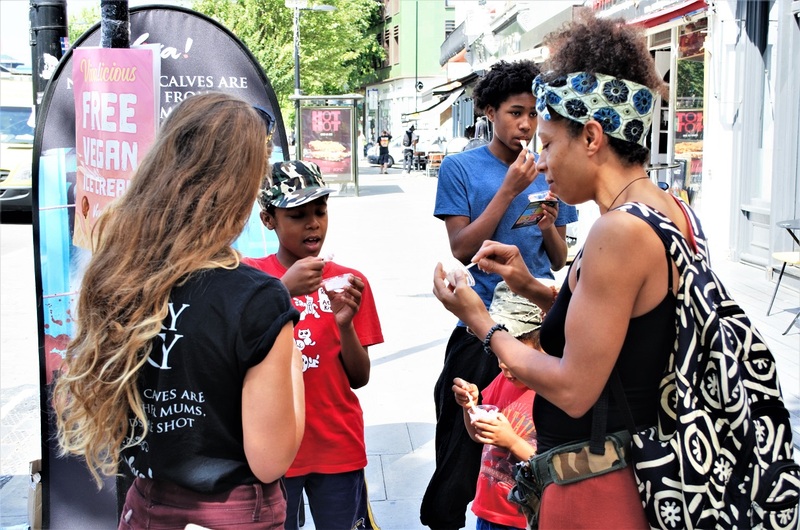 The combination of the uncomfortable truths about the dairy industry, ice cream tasting and free materials helping people change their diet, worked incredibly well as it made the public very receptive. We’d love to repeat this campaign next year.